This is the time of year when we talk a lot about all of the things we have on our lists. If an outdoor kitchen is on your Christmas list, we think we can help to simplify it by removing a few "extras" you may have thought you needed. Simplify your Christmas list (and get a better outdoor kitchen as a result) when you avoid four non-essentials that are often wrapped up like necessities. Many contractors will charge potential outdoor kitchen owners for price quotes and consultations. What's worse, many contractors will actually give you a quote without ever stepping foot on your property. Don't settle for either of these shortcuts. No one should be charged to window shop, and acquiring price quotes and scheduling on-site consultations is part of that process. Simply put, if a builder puts a price tag to a quote, move to the next window and keep shopping. We've established a hard "no" on building outdoor kitchens from wooden frames. Simply put, wood burns, and with all of the flames you'll be stirring up with your grill, pizza oven, or fire pit, we believe that using wood in the framework presents an unnecessary fire risk. Besides, red oxide-coated steel is much more durable anyway. Some people go into an outdoor kitchen project afraid to set a budget. They assume that if they put a price cap on their outdoor kitchen installation, then they won't get what they want. If that's the case, then you're working with the wrong outdoor kitchen company. Our professional designers are used to working within a budget while still delivering kitchen designs that wow homeowners. So, go ahead. Set a budget, and see what an experienced designer can do with it. Put away that all-or-nothing mentality as you're going into your outdoor kitchen design. If you don't have the time or money to invest in the complete outdoor kitchen of your dreams right now, take it piece by piece. Maybe the complete package includes a grill or two, granite countertops, a fireplace, and a pergola. Why not start with one grill and the granite countertops? The fireplace and pergola can wait until next year. Kitchen design is a creative venture, and we love it when our customers are creative in their approach to building the outdoor kitchen they've been dreaming of. 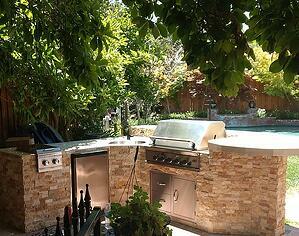 To start your creative journey toward a stunning outdoor kitchen, click on the banner below.